Formerly known as “vast jewel island” or to it’s natives as Koh Kaew Phitsadan due to it’s plethora of white sand. The island was later renamed Koh Samet or Cajeput Isle due to the bountifulness of Cajeput trees that grow on the island. 18th Century Classical Thai Poet Sunthorn Phu set some of his Phra Aphaimani saga on the shores on Koh Samed. The story about a prince exiled to an undersea kingdom governed by a giant lovesick female. The Prince aided by a mermaid escapes to Ko Samet where the giant is defeated by him playing a magic flute. The island hasn’t always been as accessible as it is today and for many years the Thai government restricted people visiting and overnight stay on the island. Bangkokians would stay in local makeshift huts or camped out in tents. There was no electricity or running water and visitors would have to bring over there own food and drink from Bangkok or local shops in Bang Phe. There was no ferry service and those wanting to access the island would have to give money to the local fisherman to take them. Between 1978 and October 1981 the island of Koh Samet was closed by the Thai Government due to an outbreak of Malaria/Dengue Fever. Despite strong warnings, brave travelers would still cross the waters to experience the untouched beauty of Koh Samet. In October 1981 Koh Samet reopened and was granted National Park status which it’s still has to this day. The Sandy tracks that connected parts of the island were slowly turned into roads and more bungalows and huts would appear around the nicer beach areas. Over the last decade 5 star resorts have slowly begun to replace the bungalows and huts around the island. Today Koh Samed still remains a popular getaway for locals and foreigners living in Bangkok. 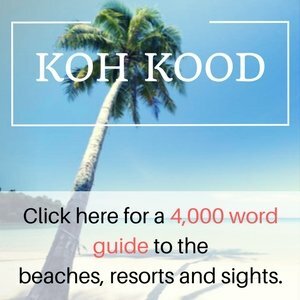 More on the history of Koh Samet island.